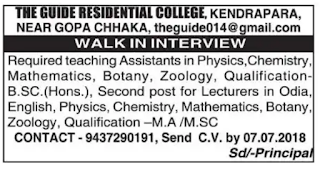 The Guide Residential College, Kendrapara has advertised in the Sambad newspaper for recruitment of Teaching Faculty- Teaching Assistant,Lecturer jobs vacancies. Interested and eligible job aspirants are requested to send CV by 07.07.2018.Check out further more details below. 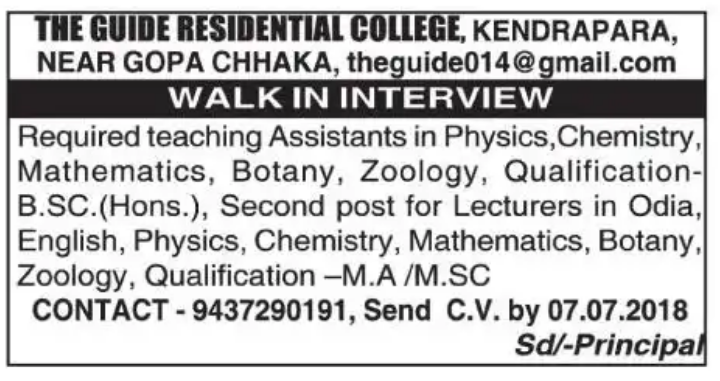 Reference: Recruitment Notification / Career Job Opportunities notice for Teaching Faculty - Lecturer ,Teaching assistant on Sambad newspaper Dated 6th July 2018.